Palladium® Rigid Sheet provides a complete range of protection for your vertical surfaces such as walls and corners and ensures reliable wall protection that is durable, long lasting and easy to clean. Building interiors take a lot of abuse. Don’t let the wear and tear of every day traffic leave you with constant and costly maintenance. 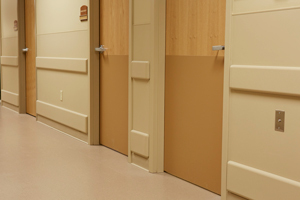 Guard your walls from scratches, dents and scrapes by installing our Palladium® Sheet. 2mm thickness available upon request, minimums apply.